Press S2 twice to enter the alarm mode, then press S4 to add hour.Press S3 to finish hour setting, then press S4 to add minute. Press S2 to finish alarm setting. PS: when alarm ring, press S4 to pause it, and it will ring again 5 minutes later. Press S3 to turn it off. Press S2 three times to enter the Time/ Date/ Week mode and second start to count from 1-59, press S3 to finish second setting. Press S4 to add minute, then press S3 to finish minute setting. Press S4 to add hour, then press S3 to finish hour setting. Press S4 to add day, then press S3 to finish day setting. Press S4 to add month, then press S3 to finish month setting. Press S4 to choose the right week, then press S2 to finish Time/ Date/ Week setting. Pull S5 and rotate crown to adjust the hour and minute hand. When adjustment is completed, push the crown back. How to change 12/ 24 hour system? When setting hour, “H”appear means 24 hour system opened. When “A”/ “P” appear means 12 hour system opened. How to open/ close alarm? Hold the S3 and press S4, when “ALARM”sign was be filled with black, alarm opened. How to open/ close chime? Hold the S3 and press S2, when all week was be filled with black, chime opened. Hold the S3 to see alarm and hold the S4 to see date. More details, please contact us anytime! 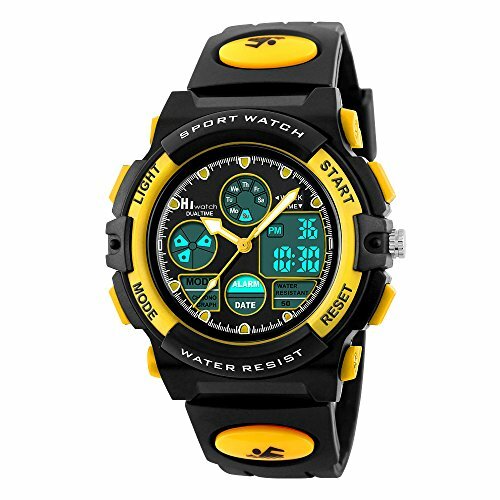 ★SPORT WATCH★: the Multifunctional Kids Waterproof Watch; with Fashion Appearance; Designed for Children Boys and Girls; Serves as Good Gift for Birthday or Festival. ★RECOMMENDED AGE★: Suggest Age from 10-15 Years Old. Watch Perimeter from 6.3-9.1 inch and Watch Dial Diameter is 1.7 inch. ★MULTIPLE FUNCTIONS★: This Kids Digital Watch Has Various Functions: Double Time Setting, Waterproof, Alarm Clock, Stopwatch, Date, Week and Calendar, EL Back Light; Perfect for Sports and Daily Wear. ★WATRE RESISTANT To 164 Feet★: with High-transparency Resin Mirror and Stainless Steel Back, This Sport Watch Possess Superior Water Resistance and Can be Worn When You are Showering and Swimming. Please DO NOT Operate the Button in the Water. ★EXCELLENT SERVICE★: HIwatch is a Professional Seller in Selling Sport Watch, We Offer Premium after-sale Service. A. 1 Years Warranty. B. 2 Months Hassle-free Return Policy. C. Seller Pays for Return if Item is DOA or not as Described. Fulfilled by Amazon with Fast Shipping.